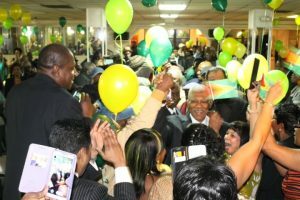 Then Opposition Leader and Presidential Candidate, David Granger mingling with the Guyanese Diaspora in New York ahead of the May, 2015 General and Regional Elections. President David Granger on Saturday defended his decision not to mingle with ordinary working class Guyanese in the United States (US), saying that he has been advised by the American Secret Service that doing so would expose him to security threats. “Some of my movements have been limited on the basis of advice from the United States Secret Service. I am a Head of State, Head of Government and they have a responsibility to their government and to our government to make sure that I do not fall into jeopardy or come into harm,” he said. The President said sometimes advice is given about walking down a street or go to a certain place and “I take their advice”. Granger has largely limited his interaction with Guyanese in the United States to upscale hotel ballrooms and conference rooms. Addressing the 5th Biennial Conference of his People’s National Congress Reform – North American Region – being held this week in Atlanta, Georgia, United States, he responded to criticisms that he has not been engaging ordinary Guyanese in Brooklyn, Queens and Florida as he had done during the 2011 and 2015 general election campaigns. “I do believe that, at a personal level, I have been unfair victim of criticism for neglecting the Diaspora…The engagements have been, to my mind, satisfactory in the sense that the Diaspora is huge,” he said, questioning who is speaking on behalf of the hundreds of thousands of Guyanese across the globe. The President said whenever he travels overseas, he makes a deliberate efforts to interact with Guyanese. Among the places he said he has met with overseas-based Guyanese are The Bahamas, Barbados, Brazil, Toronto in Canada, New York, and London in the United Kingdom. “I always ask to meet with the Diaspora so these criticisms that I have been avoiding the Diaspora are quite unfair and I am grateful for the support I have received over the years, over the last several years particularly and I want to place on record my gratitude,” he said. The President promised to reward members of the Diaspora who support the PNC. In Guyana, observers have noted that the President does not spend a long time mingling with ordinary Guyanese at public events and leaves shortly after delivering addresses. Earlier this year, a man reported to Guyanese police that he was being hired for GYD$7 million and offered a long black gun to kill Granger. However, police said the evidence was weak and so no one could have been charged. A recently concluded Commission of Inquiry into the effectiveness of the police probe into the reported allegation has unveiled several administrative weaknesses in the Guyana Police Force.